Previously we demonstrated that human stress expression correlates with level of chromosomal aberrations in blood cells, sensitivity of genome to environmental mutagenic load and with level of toxic exposure. Therefore we supposed that genetical predisposition to stress expression could be exists, and it could be looking for among family of genes, encoding enzymes of detoxification. Materials and methods. Among workers of chemical plants and control populations (totally 54 men at age of 43±3) we studied the GST super-gene family (GSTM1+/+ or GSTM10/0 and (GSTT1+/+ or GSTT10/0) and PON 54 gene polymorphism (L/L, L/M or M/M) as well as stress expression. Level of stress was tested by block of standard psychological questionnaires, detected psychological depression, alarm, overfatigue and interpersonal relations. Both GSTM1 and GSTT1genes ensure the synthesis of the relevant products that belong to the Phase II detoxification enzyme system, responsible for biotransformation and degradation of certain electrophilic compounds. PON 54 gene takes part in the Phase I of detoxification enzyme system. GSTM1, GSTT1 and PON 54 genes polymorphism analysis was carried out in blood samples as described elsewhere. Results are present in the tables. Correlation between deadaptive stress expression and frequency of GSTM1 0/0 (PЈ0,05) was discover. Discussion. Our results are in a good agreement with H.Selye conception, in accordance with that stress is first and normal reaction of an organism to any influences. In dependence of power and/or duration of influences and adoptive potential of an organism stress expression is norm (adoptive) or deadaptive. Minor alleles in genes, encoding enzymes of detoxification, bind with decreasing of detoxificative functions of their products. 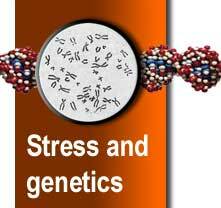 So, real toxic load to the organism with tese alleles increases, what can be expressed as deadoptive stress reaction.